In March 2016, Campus Advantage acquired The Edge, a student housing development in Orlando, FL. 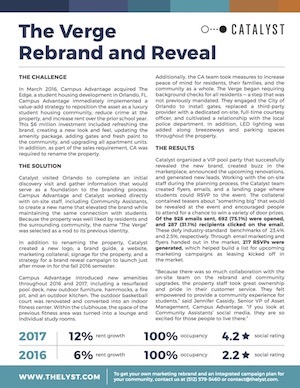 Campus Advantage immediately implemented a value-add strategy to reposition the asset as a luxury student housing community, reduce crime at the property, and increase rent over the prior school year. This $6 million investment included refreshing the brand, creating a new look and feel, updating the amenity package, adding gates and fresh paint to the community, and upgrading all apartment units. In addition, as part of the sales requirement, CA was required to rename the property. Catalyst visited Orlando to complete an initial discovery visit and gather information that would serve as a foundation to the branding process. Campus Advantage and Catalyst worked directly with on-site staff, including Community Assistants, to create a new name that elevated the brand while maintaining the same connection with students. Because the property was well liked by residents and the surrounding community, the name “The Verge” was selected as a nod to its previous identity. In addition to renaming the property, Catalyst created a new logo, a brand guide, a website, marketing collateral, signage for the property, and a strategy for a brand reveal campaign to launch just after move-in for the fall 2016 semester. Campus Advantage introduced new amenities throughout 2016 and 2017, including a resurfaced pool deck, new outdoor furniture, hammocks, a fire pit, and an outdoor kitchen. The outdoor basketball court was renovated and converted into an indoor fitness center. Within the clubhouse, the space of the previous fitness area was turned into a lounge and individual study rooms. Additionally, the CA team took measures to increase peace of mind for residents, their families, and the community as a whole. The Verge began requiring background checks for all residents — a step that was not previously mandated. They engaged the City of Orlando to install gates, replaced a third-party provider with a dedicated on-site, full-time courtesy officer, and cultivated a relationship with the local police department. In addition, LED lighting was added along breezeways and parking spaces throughout the property. Catalyst organized a VIP pool party that successfully revealed the new brand, created buzz in the marketplace, announced the upcoming renovations, and generated new leads. Working with the on-site staff during the planning process, the Catalyst team created flyers, emails, and a landing page where students could RSVP to the event. The collateral contained teasers about “something big” that would be revealed at the event and encouraged people to attend for a chance to win a variety of door prizes. Of the 928 emails sent, 692 (75.1%) were opened, and 287 (31.1%) recipients clicked on the email. These defy industry standard benchmarks of 23.4% and 2.5% respectively. Through email marketing and flyers handed out in the market, 217 RSVPs were generated, which helped build a list for upcoming marketing campaigns as leasing kicked off in the market.